I don't have too much to show in the weaving department. I'm still working on the three-baby blanket warp, though I am very close to the end. So far I've woven 2.5 blankets, with only one more session needed to finish the actual weaving aspect of the project. Each blanket is woven in two morning sessions, so it is actually a fairly fast weave. That's a good thing, since throwing the shuttle across 42.5 inches stresses my shoulders. It's very hard to see the pattern while weaving, so I'm hoping I don't find too many floats or errors once the material is off the loom. I happily started the back-stitched outlines, but yesterday, I asked my son if they are going to keep the baby's name secret until he is born, and that is indeed the case. That puts my self-imposed deadline much further out. I was hoping to give my DIL the completed stocking on her birthday, which is mid-July, only a week or three after the baby will have been born. 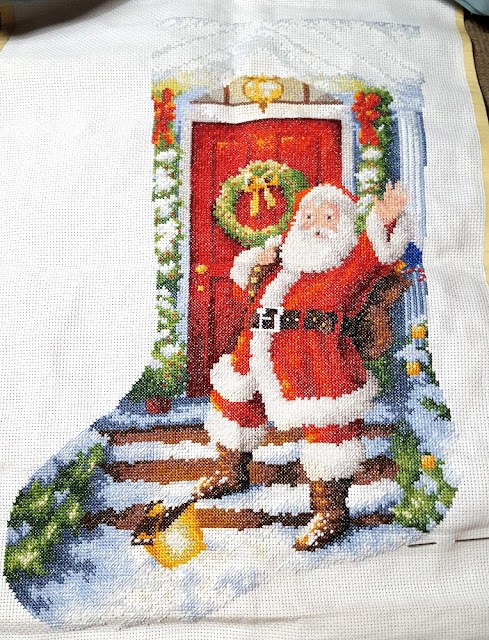 That time is not long enough for me to do the finish work after stitching the name, so the stocking will have to be given later, perhaps on Thanksgiving. She is someone who starts to put out Christmas things in the fall, so I thought I would really surprise her at her birthday, but a change of plan is called for. Instead, I started knitting on a zip-up-the-back sweater for the baby, and boy, does it feel weird to knit after such a long absence! Hopefully, the sweater won't take too long, and I'll be able to put it and one of the blankets away until the baby shower. We're just starting a very unusual mid-February thaw. It snowed ~6 inches Saturday night into Sunday, but since then the temps have been on the rise, if you don't count the 20's from last night. It's forecasted to reach 53 degrees here in the midcoast on Wednesday, but Portland will be in the mid-60's, and south of that might hit 70! It won't last, but I'll take every non-winter day I can get. I went for a nice walk this morning, and even though it wasn't all that warm (30's), it felt great to get outside and still be able to feel my face. I'm working an extra shift this evening, so tomorrow may be less productive, but I really hope to get the blankets off the loom this week, after which I can look for and repair errors before wet-finishing. Huck Diamonds Are Off the Loom! !